This Term, Point England School are studying Art Attack as our topic. 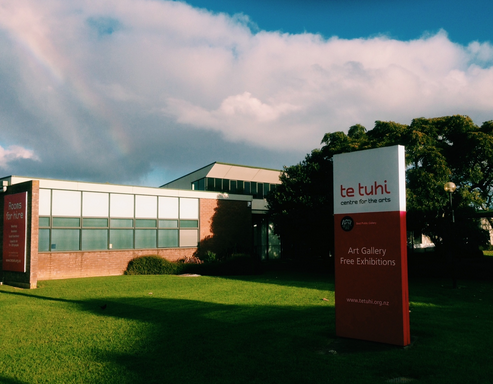 As the term is almost coming to an end, class 2 were fortunate enough to go to the Tetuhi Art Gallery down in Pakuranga. And I'd have to say it was a morning full of experience! 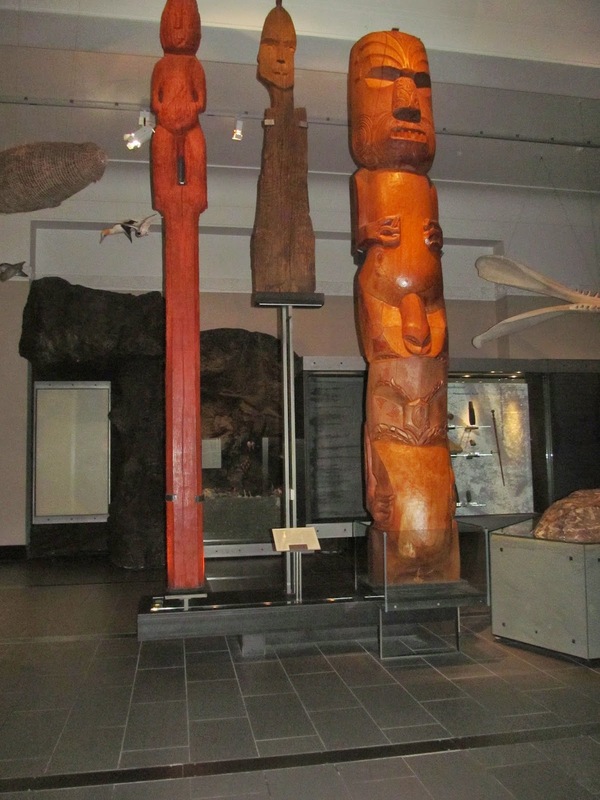 Walking into the Tetuhi Art Gallery, I was firstly amazed by the different Art displayed on the walls. We luckily had someone guide us, Jeremy. He led us to the Art room and our task was to create a tapa design. Again, I was amazed by the nice pieces of art that were displayed on the walls of the room. I saw paper-made shoes dangling from the ceiling as I walked in. Sitting down on the table, I noticed containers of dye and ink placed in front of me. I grew excitement! Our first instruction was to crinkle the paper. I'd have to say that was not my favorite. The paper wasn't any normal paper, it was actually a machine made paper which felt kind of hard. The next task was to rub the side of the pastels onto the squares of the paper. Than we got to the fun part. Jeremy handed all of us big paint brushes to add dark brown dye onto our crinkled paper. After the dye dried up, we were all given pencils. Our task was to draw 4 symbols that represent us ( interest, culture, home and family ) I'd have to say I was really proud of my work! Lastly we had to get a small paint brush and paint some brown ink onto parts of our art. Overall my trip at Te Tuhi was a great experience! I really do hope we get to go again next year. I learnt a lot of things. Like knowing how to put dye on paper correctly and how to make a tapa design as well. I do recommend going there! Here is a presentation showing you tattoos that I have drew to show the many things that represent me and my background. The extension crew have been focusing on the samoan tatau for the past few weeks. Mrs Tele’a sent us a task to draw two separate tattoos that represent ‘me ‘ and my background! Each of the detail I used in my tattoos is to represent something. Mrs Tele’a has helped us by leaving some questions that could help us with our tattoo. The extension crew have been learning about the history and the design of the samoan tatau for the past few weeks. Last week, Mr Tele’a was our model and inspiration. Our task was to ask him questions about his Tatau, to get more information and stories behind it. 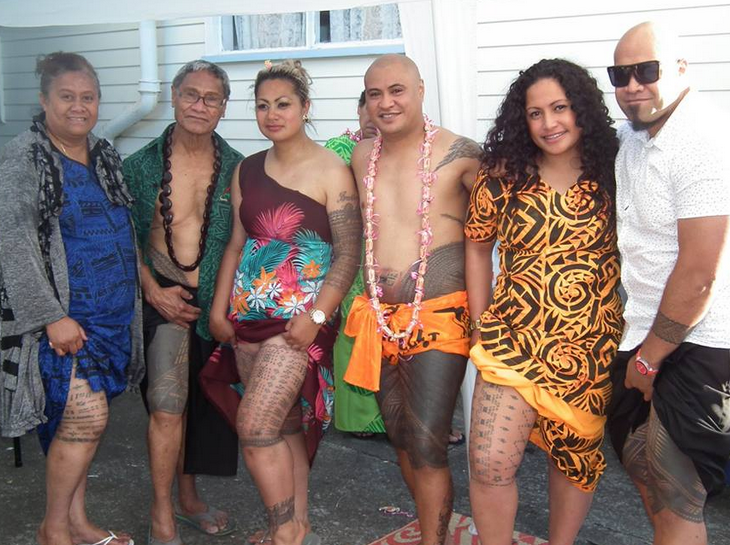 One of the questions were “ Would you mind if your sons had gotten the tatau? “ Mr Tele’a stated that he would surely be proud if his sons got a tatau, but he wouldn’t force them to get it. While listening to the questions and answers that were being said, I captured the idea of the tatau. Mr Tele'a did not have the choice of choosing the design of the tatau. The artist chose to research Mr Tele'a's village and included a few motifs that were related to his research. Looking at the design of his tatau, I could see a lot of diamond chained patterns. I could also see a lot of lines included into it as well, which looked really great! But I knew that they weren't there just to ' look good' I knew it actually meant something. The belly button is known as the last part to get tattooed of the tatau, and is also known as Mr Tele'a's most memorable bit of his tattoo. For the previous few weeks, I learnt that you could get your tatau or malu as the same time as someone as they are called your soa. I also learnt that a soa can be a sign of support and help as well. Mr Tele'a said that his soa's were his three brothers. So he must've been really glad with his brothers by his side. 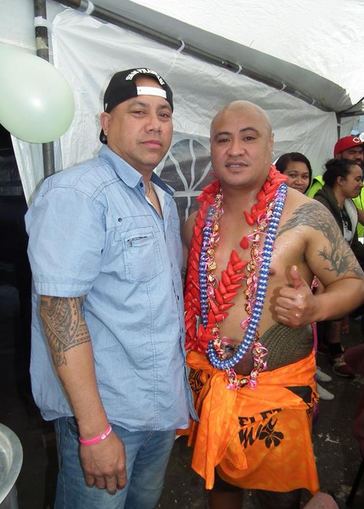 A tufuga is an artist who does your tatau. 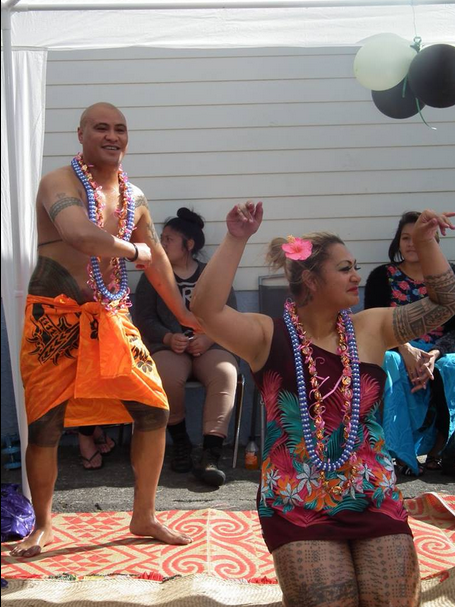 The tatau can only be done by two families which are Suluape and Su'a. Mr Tele'a's tattoo was done by a tufuga name Tuifa'asisina Su'a. 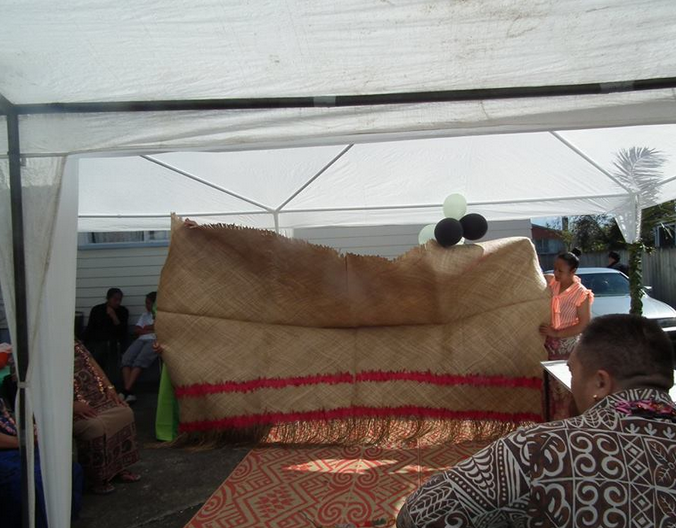 Tuifa'asisina was also a tufuga for my uncle Semu and his fiance Julianna. But the two families are looking forward to teaching others how to do it. During the progress of the tatau, there are two men who sit with the tufuga and stretch the skin to make the tufuga's job easier. Their job is also to wash the equipment after use. If not washed, there may be a chance of the next person to get infected. Overall I am really satisfied with I've learnt throughout out the few weeks. Getting to talk to a experienced tatau person, like Mr Tele'a has been a major bonus! On this dull raining day, I watched an inspiring speech spoken by Hyeonseon Lee. Hyeonseon grew up in North Korea. Hyeonseon Lee stated that America, Japan and South Korea were the enemies to her country. At the age of 14 Hyeonseo Lee escaped N. Korea to China. She spoke " In china it was hard living as a young girl without my family " At that, I knew that it must have been hard on her. Please listen to these inspiring words of " Hyeonseon Lee's Escape From North Korea "
Recently, I watched a short 8 minute film called " You Never Know " This film is based on a mother with 3 children. She is always very busy. Whenever she makes plans the outcomes of it are not very expected. Here is a Mormon message to share with you " Sometimes, the most important things you do each day on your to-do list. You might worry about the things your never done, but president Gordon B. Hinckley reminds us, " You never know how much good you do "
Ebola is a very severe virus. A victim who has Ebola is most commonly known to bleed inside and outside of their bodies. Ebola was first generated in Sudan which is located in Northern Africa. This disease can be found in Africa, with a few in Europe and United States. Here a 3 ways to prevent from this certain disease. Ebola was recently found in Australia, after a nurse had come from treating people in west Africa. A Dallas nurse, aged 26 years old is now known as the first person to get infected with Ebola from a infected human on U.S soil. If you don't know which countries Ebola has been reported in, check Google or look out for the news or even ask an adult. If the person looks really ill, stay away from the victim. When going near a person with Ebola, it could easily be passed on. Wearing protective gear is very recommendable, ' if ' you have to go near someone with ebola to help them. Try not to eat from the same bowl or plate or else you could get infected by the bacteria. Investigators have been curious that ebola came to humans via animals. If your in an area where ebola has been reported in, prevent buying, eating wild food to stay on the safe side. Immersion Assemblies are a great way to start off the term. Every beginning of the term, Point England School get to have an assembly related to the topic. This term our topic is “ Art Attack “ . This means we are focusing on Art and different artists too. During Immersion Assemblies each team provides an item/movie that is related to the topic. Teachers often wear different costumes and wigs as part of their item. To start off the Assembly we had Team 1 show their item 1st. Watching Team 1’s item, I could see that they were going to learn about the beach and environment. They are going to use nature to inspire their art. Looking closely, I saw the team 1 teachers were wearing beach related clothes. Team 1 was very lucky to hear good news that they were going to the beach as part of their learning. Moving on to Team 2, they did a movie based on the Primary Colours ( Red, Blue and yellow ) Listening carefully, I captured the idea that they were learning about mixing and colours too. Miss She, Mrs Glaze and Mrs Dwyer dressed up in different colours to add to their item. Team 3 than did a item based on different artists such as Andy Warhol, Da Vinci and other artists too. Team 4 decided to create a competition of who the best artist was. There was Vincent Van Gogh, Fatu Feu’u, Monet and more. Firstly Mrs Garden, interviewed the artists one by one. Listening to the contestants, I discovered what kind of art they drew, their name and what they like. At that, I knew that Team 4 was learning about different types of art and artist. Team 5 got up on the stage wearing really artistic clothing. Even French hats. I had no idea of what we were focusing on. The teachers then started to sketch with paint. I still had no idea. When their item almost came to end, they turned their piece of art the right way. I could see it was a self portrait of Mr Jacobson, Mr Burt and Mrs Jarman. I was really amazed! This year is election year. Which means people living in New Zealand, get a chance to make a decision on how New Zealand can change. If you walk around places like Mount Wellington or Panmure you will notice many people holding up signs of certain parties to show support. To be honest, this years elections has offered some very great policies! National has decided to generate new jobs for people. I think this is the best policy national has provided. Due to people who are looking for jobs and people who are not getting paid much. I absolutely agree with what national had said about this. Children under 13 get a free doctors visit. This gives a great opportunity for families that don’t get paid much money on a weekly basis. To me, I think national has done a great job with the age standard. But I also think that we should also give free treatments too, like medicine. Since many serious treatments can be very expensive. National has decided to extend paid parental leaves for parents who are in their first year of a childs life for up to 18 weeks. Getting paid while absent due to parental leave is great. Because this gives the time for parents to buy enough clothes and food for the babies next few years to come! Giving children $350m dollars for student achievement. Labour will provide $60 for most families in the first year of a childs life. This policy is similar to Nationals policy. This is great chance for poor families to finally get food on the table and buy clothing and footwear for their child. Labour will grow free early childhood education to 25 hours a week. Labour will provide more plunket visits for families that need it most. This is one of the greatest policies “ labour “ has suggested! Its telling me that many sick children or babies are not getting enough treatments for their health due to less money. Labour - “ and to leave more money in your pocket to pay the monthly bills, Labours NZ power policy will reduce your power bill by preventing power companies from overcharging “ To me, labour is saying that they will make power bill prices more smaller. And also stop power companies from overcharging. Fortunately National has won this years election and John Key is looking forward to making a change around New Zealand. Most certain parties have been very outstanding throughout the votes coming in. I think that New Zealand should be put in a better position for the next three years. Recently, my dad took his vote at Point England School. I was hoping he’d vote for the party I supported. Turned out, that he voted for the party I wasn’t really feeling. Mirror Changes Way Women Look At Themselves. New Project 3 from Team 5 PES on Vimeo. The 11th of September marked the day of the Point England cross country. Cross country, is an event that is held every year for our whole school. Our school was fortunate enough to have good weather. Every year in cross country each house coloured team will have the chance to say a chant, to earn points. Our house coloured teams are named after the seven canoes (our ancestors came in), but only four of them. Such as Mataatua Takitimu, Tainui and Te Arawa. Each team has a house captain, who are one of the biggest supporters for their house. They encourage others to never stop. As I changed into my running clothes, I felt really nervous. I wasn’t ready for this. When the clock struck close to 12pm , my heart started to grow heavy, my palms were sweaty and butterflies were in my stomach. I sat on the courts nervously looking around, only to see a few people excited and highly strung at the same time. Luckily the Year 7 & 8 got to support and watch the younger kids finish off the race. Fortunately I started to lose my butterflies as I saw the others trying their best. Unfortunately, the weather was growing too hot. I felt drips of sweat streaming down my forehead. Mrs Nua then announced that it was time for the Year 7 Girls to get ready for the race. My butterflies grew back. I felt really unusual. As I went to line up for the race, I started to play with my fingers, not paying attention to anything at all. Mr Burt was standing on the sideline, with his blocks, ready to start the race. “ BANG! “ the blocks crashed together loudly., in the blink of an eye. I sprinted at first, which wasn’t the right choice to make. Running through the mud, I searched for my friends at the same time, hoping I’d had catched up to them. As I looked down , I noticed splashes of mud all over my feet, “ Uuuugggghhhh “ I thought. It felt totally disgusting. Catching up to Ms. V , my lungs started to pump, and I started to breath heavily. “ Keep on going! “ shouted Mr. Slade. At that, my legs started to hurt but my lungs were going fine. I felt really, really sore. So I decided to stop. As I got to Ms Erasmus, I had started to do a little jog, to help me get to the finish. I finished my first lap and was ready to go for a second lap! Hello Prime Minister John Key. My name is Josephine and I am a twelve year old student at Point England School. Today in class, we were discussing how plastic is polluting the sea and how its causing trouble to our ocean. I think that we should ban plastic from the ocean due to unhealthy sea creatures, polluted sea, accumulation of rubbish and an unhealthy environment. Plastic should not be wasted but we should as New Zealanders reduce, reuse and recycle our plastic belongings. Plastic is one of the things that have infested our oceans and the creatures living in it too. When they consume plastic it is very toxic for the sea creatures because they mistake it for food. When they swallow it, it causes stomach and liver problems. Not only to sea animals but birds too. An oceanographer named Charles J. Moore said that “this is choking our future in ways that most of us barely aware”. He has just finished his first in depth survey of the great Pacific garbage patch. New Zealand should avoid having to throw away plastic bags. We should be able to reduce, reuse and recycle. Our country should be healthy and in good condition. I’d recommend that New Zealand should start to change our country into a tidy environment. Having a cleaner environment is very healthy for us and our living sea animals. This letter represents why we should recycle plastic bags and not put them into landfills. Because it can put us at risk and the underwater creatures too. Prime Minister, I think that we should start to make a change today! Why Should Children Exercise ? Kids should always exercise everyday due to having a healthy strong body. When having a healthy body, you will be able to do lot’s of physical activities like playing sports. I’d recommend that kids shouldn’t eat foods with lots of calories because it affects the way the body works. Eating foods that have vitamin c is a great big YES! It can help you improve your fitness and your thinking too! Unfit people are not very fond of walking or jogging. Walking at least twice or once a day is recommended for all ages especially sedentary people as well. The reason behind this is because walking/jogging can give you a full active body. Meaning that when you are active, you could have the ability to join lots of sports or maybe even better! Exercise is very valuable for your lungs and heart. Because it can increase the energy in your lung and heart which makes it stronger and healthier! Meaning you can walk, play sports or run even longer than usual! Taking action in being fit also supports weight. When you are exercising the calories in the food you eat will start to burn off. When you are active fitness gives you a better self-image and improves your confidence too! Daily physical activities can be fun! Sometimes exercise can be part of your favorite daily things to do in life, like running with your friends, walking the dog, playing on the playground and also playing sports. 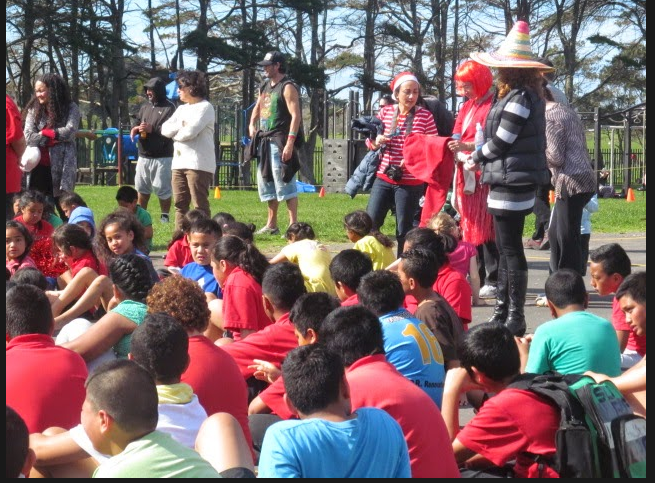 Activities at school , like kiwi kick, soccer or basketball is an example of fun physical exercising. Not only is exercise good but also eating foods that have vitamin C! When consuming foods that have less calories it supports your health too. If you eat lots of foods that have a bad amount of sugar or sodium, this may also lead to a disease called diabetes. Diabetes can hurt people of all ages, not just adults. Healthy foods like Carrots and oranges is a great example of vitamin C! So healthy foods should be eaten more and unhealthy foods should be eaten more less. These paragraphs represent why kids should exercise daily. Researching the internet, I have found out that 40 million under the age of 5 were really overweight in 2012. So the point of what I am saying is children should exercise daily because it is really healthy and good for you and it also puts you out of worries. The Point England extension group were fortunate enough to go to the Telstra Clear stadium and listen to special authors! Such as Paula Green, Catherine Mayo, Jill MacGregor and Juliette Mclever. These authors shared stories about how they developed books for children and how they got to become great authors! The authors that I enjoyed the most was Paula Green and Jill MacGregor. Paula Green told us about her life and how she loved poetry and it really inspired me! Paula has just released a book called '' The Letterbox Cat And Other Poems " you can check out her blog here http://nzpoetrybox.wordpress.com/ Jill MacGregor was an author who traveled around the pacific, her books were about peoples shape of life. The thing I most enjoyed about her was how lucky she was to travel around some countries. If I were an author to present at the storyline festival, I would bring my first book I ever wrote and tell people what it felt like to publish this book and tell things that inspired me to write about it! Unfortunately the Authors only spoke for a few minutes. I was really looking forward to hearing about the first book they have ever read! I want to find out how long the authors take to write a book. While sitting down at the Storyline Festival, I was really inspired by the Authors. I really loved how they tried to talk so much in such little time. Storyline Festival taught me lots I have not yet known. I really hope I get to see the same authors next year, so that they could tell me more. I especially loved how the authors connected a lot with the audience. Growing up healthy and safely is one of the biggest priorities to humanity. It is important to stay safe and healthy because it can keep you out of danger and sickness. When you are being unhealthy or unsafe not only can it affect you, but it can affect others. Drugs can be one of the things that can lead to an unhygienic mind and body. Drugs is not a type of food or drink, it can cause danger when entered into the body. It can affect the way your body works and the way your mind works too. There are all types of drugs such as Marijuana , Cocaine and even party pills. Drugs can be very dangerous when entered in to the body at a young age because the brain has not fully developed yet. These things can lead to an obsession, and when people get addicted to it the drugs cause danger more and more. Spirits, wine and beer is one of the things that can also make you unhealthy and unsafe. Taking more than one drink in an hour can cause bad things to happen in your blood! Drinking more than a high standard in an hour at a young age is very bad because it can affect the brain works or even worse. Taking care of yourself and having a good hygiene is very good for you and your surroundings. If you do not take care of yourself, it can lead to danger and illness. Drinking and taking drugs is one of the examples that are very unvaluable. Because it can change your emotions and even the many things in your body, such as the neuro transmitters. So i’d recommend that you should always keep yourself neat and out of danger! Today was the last day playing Astria Countdown To Impact for group A. My partner and I completed speaking to the council and giving them our evidence that we had gathered from the past few days. The key areas we managed to complete today was in the council room, we managed to talk to them more and give them our credible evidence! Tomorrow I will try to remember to use my eyes to look around the room and find more clues to give to the council. One of the hardest things of today's session was trying to understand what the council leader was saying! Hopefully tomorrow we will get to finish off the game in our own time and save the planet of course!! This afternoon, Ashley and I didn't really get enough time to do the game today! But I was able to find some clues around the room. I was really shocked at how many days we had left (35)! So I quickly went around the room searching for answers. Ashley was helping me too! Today we were able to find a clue that had a definition. Ashley and I have a goal to work together more often, and spend more time on it! I'm sure tomorrow that we will try harder and defeat our goal! The most easiest part of today, was interacting with the characters to find some clues. It really helped! What my partner Ashley and I need to improve on is using our eyes together and trying together! Thats what can help us finish it off properly! Today, Point England's yr 7 & 8 girls were fortunate enough to have a friendly game against Stanhope at our school. It was one of the greatest games I have ever played in league and actually my first too! For today's game I played centre and winger which are positions I haven't really played before but am very use to. Running through the slippery mud was one of the hardest things today. The weather today was really complicated, there was falls of rain that kept on stopping then going. It was really annoying! One of the most interesting part about today is when one of our girls scored lots of tries on her own! and that was totally amazing. While playing rugby I accidentally didn't know what I was doing and then high tackled a girl that was shorter than me. Today, I am really happy with the outcome of today! I had lots of times, sometimes hard time but still made it through to get a good result. I do hope that many more games like this are to come. On a warm Saturday, my family and I went to the Sylvia Park Hoyts Cinema to watch a movie called " Star wars: Guardians Of The Galaxy " This movies is one of the greatest movie I have ever put my eyes on. This movie shows a lot of true power of friendship to me. 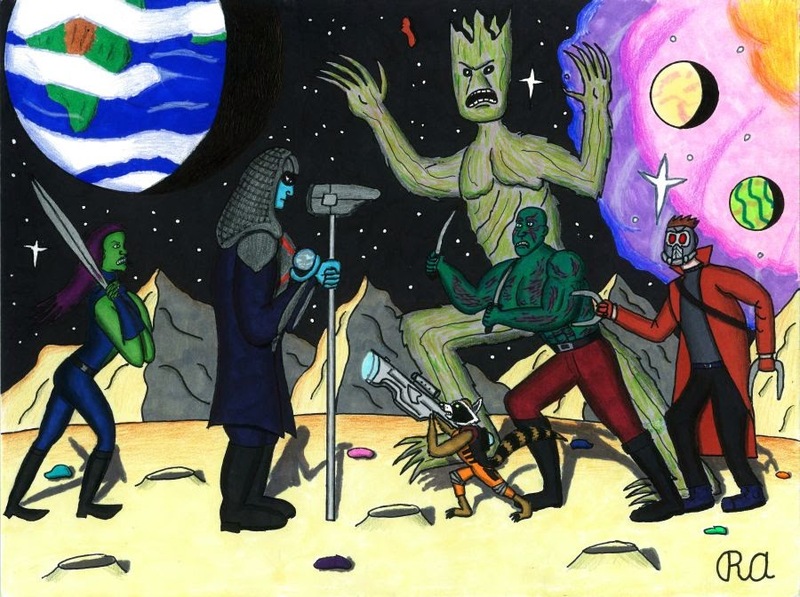 Guardians Of The Galaxy is a movie based on a group of guardians who are friends trying to defeat an enemie named Ronan who made a plot to destroy their city! Ronan was one of my least favourite character! My favourite character is Gamora who was adopted with her sister to a very evil man who was part of Ronans plot, actually the leader of it! Gamora had a plan to escape from him, but her sister refused. Gamora had decided to portray Ronan and be a good person! That is how she got to be a guardian. One of the funniest parts is when the star-lord started listening to 80's music and killing insects at the same time. Did you know Batista is featuring in it too? Also Vin Diesel as groot? Overall I recommend everyone to watch this movie, this movie can really teach you a good motto! This movie can sure get you hooked in to every single part from start to finish. Hopefully, fingers crossed, they'll be a part two! Have a good night! ( Photo from Link here , drawing not actual movie image! Photo credits to owner ( RA) . This morning, Class 2 got to learn something really eye-opening at the Life Education Caravan! As I sat down inside the warm caravan I looked around the walls only to see photo's of types of alcohol. It came to my mind that we were learning about spirits and beer. Over the past few weeks we have been learning about drugs and the affect of it. Today was our last session so Lynn decided that we should learn about alcohol. This morning I learnt that alcohol is one of the severe things that could enter your body, if you drink more than one. Drinking at a young age, can be very dangerous because your body hasn't fully developed. Lynn says that if you drink too much in an hour you can start to feel angry or very emotional. You can even become unconsciousness. Today we watched a short film about other peoples side of drinking. It was really inspirational! From what I have learnt in the life caravan, I learnt that taking drugs or drinking at a young age can put you at risk. Lynn has taught us a lot of valuable things in the past few weeks. I really hope that I can keep these lessons with me while I grow up. 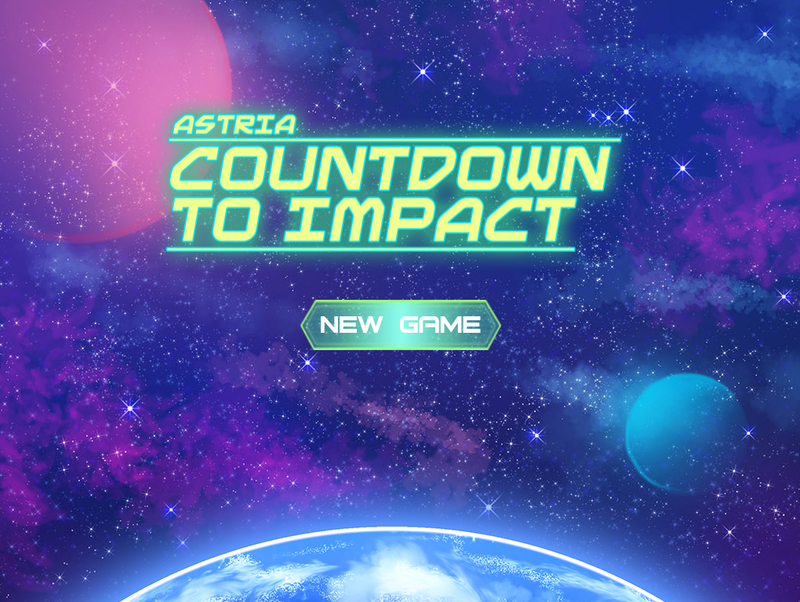 This morning, our extension class was given the experiment to try out a new game called Astria Countdown To Impact! A group of people from the wolf and co, who were based in the university of Auckland gave us tests to complete before we try out the game. Did you know that the extension class 2014 is the first in New Zealand to try out their new game? In order to play this game, we were told to pair up in partners for this task. I paired up with Ashlee who was basically sitting next to me the whole time! The most difficult part of today's session was figuring out the code with Ashlee on the game, it took us a long time to find out the code. The most easy part of the game was finding clues because all the clues were lying around the lab. Today as we played the game, my partner and I managed to unlock the code and find the clues. To be honest, my partner and I do not feel like we are on the right track because we sometimes get confused during the game. Tommorow I will try to remember to stay focused and work with my partner more, sharing ideas and co-operating! August 4th, 1914 marked the day of the first world war 1 centenary. This morning at Assembly, Mr Burt told us a story about ‘ The shot that echoed around the world ‘ . It was about a Archduke, who got shot. The archduke was very well supported, and ever since that shot fired, countries like the Russian or british empire have been in war with other nations such as germany. Mr Burt said during assembly that his grandfather fighted in the world war 1 as well as Ms. Flavelles. Mr Burt and Ms Flavelle are very lucky that their grandfathers came back safely. Today was very special because our school raised our flag in remembrance of those who were in the war. Overall from what I have learnt this morning, I learnt that lots of those soldiers worked really hard and put a lot of effort into themselves. Lest we forget means that we should show gratitude towards our past soldiers and not forget about how they sacrificed the things for us New Zealanders! Singapore is located in Southeast asia. Did you know that Singapore’s population is 4.7 million? That's a lot! In Singapore they speak English, Malay, Tamil and standard mandarin. 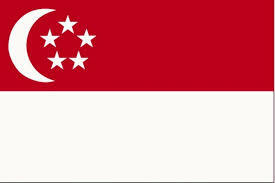 In the Singapore flag, the red stands for brotherhood and equality of man. In the corner there is a moon with stars that symbolises young nation on the rise! The most known sport in Singapore is football, supercar motorsports, cricket, rugby union and more. As you all might know, singapore is competing in the commonwealth games this year in Glasgow scotland. Singapore has just won the bronze medal in mixed badminton! The flag bearers for singapore were Jonathan Chan who is a diver in the commonwealth games. Singapore has taken part in ever commonwealth game since their first appearance in 1950 with delhi in 2010! I would really like to send good luck to the singapore team who is competing other countries. All the best singapore! Here is all the facts I have found out from different sites! I hope you will read the facts and discover un-known things. Commonwealth Games started in 1930 and happens every 4 years! This years Commonwealth games is held in Glasgow. Did you know glasgow is the largest city in Scotland? When women in the commonwealth games ride their bikes, they wear special shoes that clip onto the pedals of the bikes! But to not hurt themselves when they fall they have to get off quickly! In the commonwealth games 71 people participate and there are 17 games! On the second day in march every year, an annual celebration for the commonwealth is held to mark the commonwealth’s achievements. The commonwealth is made up of 53 member countries! At the 2014 games there will be 6,500 athletes from 71 nations competing in 17 sports in 11 days. More than two billion citizens, over half of whom are 25 years of age or less, and a quarter are under 5 years old.